The results of a council survey of Eastleigh residents underline the folly of its plans to build more than five thousand homes on the outskirts of Fair Oak and Bishopstoke, ADD said today. The public response shows that people want above all to minimise traffic congestion, preserve strategic gaps between villages, receive good medical services, reduce pollution and noise and protect the natural environment. Options B and C of the emerging Local Plan threaten all these objectives. To view the results, click here. 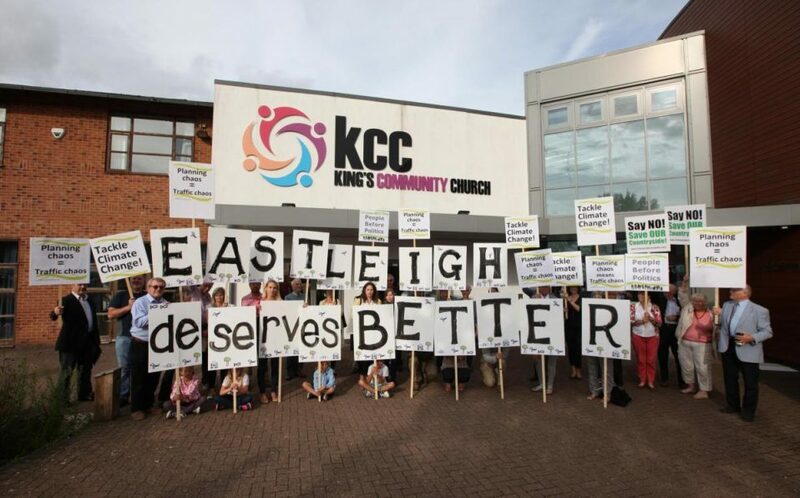 ADD recognises that new housing in Eastleigh is both necessary and desirable, but believes the council has chosen to locate them in areas that would maximise road usage and damage to the environment. Eastleigh Borough Council is due to vote on these plans at a meeting at 7pm on Monday 11 December at the Hilton at the Ageas Bowl (SO30 3XH). ADD anticipates councillors will vote in favour of these flawed proposals (despite lacking large amounts of evidence to support the case). View papers for the meeting here. “The public attitudes revealed by the council survey underline the folly of options B and C of the emerging Eastleigh local plan. Residents want to reduce traffic congestion at the same time as protecting strategic gaps between villages, reducing noise and air pollution and promoting medical services and the natural environment – objectives that we share. “Yet if these options went ahead they would achieve the very opposite. They would create a massive urban sprawl, maximise car usage and therefore traffic congestion, creating 26,000 additional vehicle movements a day by building homes far away from public transport and motorway access and away from where people want to be. At the same time, the plans involve an ill-considered link road that would actually add to congestion, whilst permanently damaging ancient woodland and the River Itchen and slicing the village of Allbrook in two. Stoke Park Surgery, meanwhile, has warned it would not be able to provide the service needed if options B and C were to go ahead. Note: ADD is an action group set up to promote a sustainable response to the need for new housing. We are an evidence-based, politically neutral campaign that has the future of Eastleigh, the natural environment, the lives of residents and the surrounding area at heart. We have considerable support from organisations including the Campaign to Protect Rural England, the Woodland Trust, Friends of the Earth, the Campaign for Better Transport, the Angling Trust and many others. For further information, contact Mark Baylis of ADD – email: [email protected]; or tel: 02380 651473. © ADD-EASTLEIGH 2016. ALL RIGHTS RESERVED.